Cindy is a very kind and sweet dog who loves to stay close and has her very own pillow along with her favourite place in the bed. She came in as no.3 at Springer östras showdog 2004. Cindy is mother of three litters and to read more about them aswell as seeing pictures of them go to previous litters. 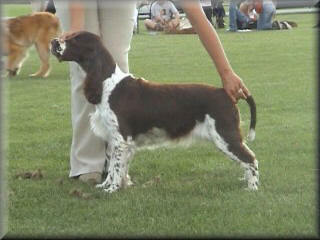 Her progeny group became BIS-3 at Stockholms International dogshow 2006. Cindy has not been presented in the ring as much as our other dogs as she prefers to run around in the forest rather than in the showring. During the summer of 2009 Cindy moved to a relative to us, where she lives with Corrines brother, a perfect outdoor living with plenty of activities which is exactly what she loves. Our lovely Cindy has left us after a brief illness in May 2012, we miss her so much, always so cheerful and positive.